1 app, 1 process, 1 page. Want to grow your bookkeeping business? PayVu enables you to add the following new, higher profit payment services to your bookkeeping business without needing extra staff or time, freeing your clients to spend more time focusing on their own business growth. No more wasted hours chasing clients for approvals. Recommend payments for clients to authorise or reject at their convenience via their mobile phone. Once registered and approved by your client, you can securely pay all supplier bills on their behalf without needing their banking credentials. Once you’ve calculated your client’s BAS obligation, you can process the BAS payment directly via PayVu to ensure prompt payment. Pay all wages and salaries quickly and securely with PayVu. Do your clients have challenges paying super? PayVu makes same day* superannuation payments and uses ClickSuper to deliver SuperStream compliance. This provides small business up to 4 extra days** to secure the cash flow to pay their super on time. * payments must be authorised by 4pm AEST on a business banking day, to be paid on the same day. ** compared to superannuation paid by direct debit. Provide a complete and compliant payment service to all of your clients by paying bills, wages, salaries, BAS, Payroll tax (QLD/NSW only) and super in just a few clicks. PayVu uses ClickSuper for SuperStream compliance. No more reviewing, managing or making edits to clients’ ABA files. Clients won’t miss making payments due to an expired ABA file. You don’t need to know clients’ banking credentials to facilitate business payments. Your clients’ critical business and banking information is kept secure via Multi Factor Authentication. Improved labour efficiency and higher profits for your business. Streamline payment approval/rejection between bookkeepers and clients. Recommend bills, wages, salaries, taxes and superannuation for payment in just a few clicks. Automate all software & banking logins via secure Multi-Factor Authentication. All outstanding items in your client’s accounting software are instantly displayed in a “single pane of glass view” so you can recommend them for payment by the business owner at the touch of a button. Payments approved by the business owner are automatically sent to internet banking for processing. Rejected payments are re-set to unpaid, notifying you of the reason for rejection. Clients can delegate secure payment authority to you so they can focus on growing their business, while you automatically and securely process payments via the business’s internet banking. 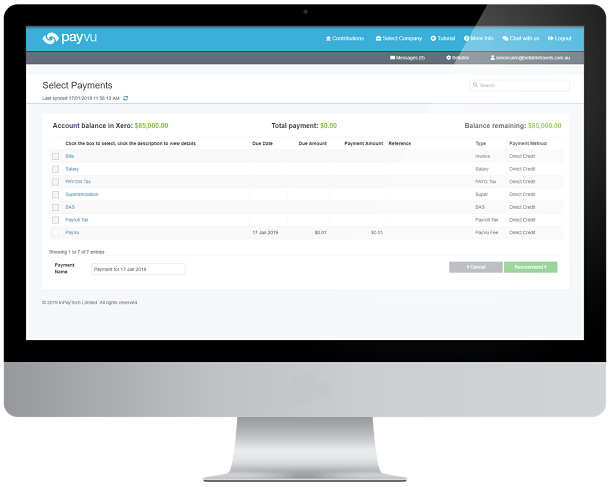 See all payment types on a single screen & sort by date. Recommend supplier bills, wages, salaries, taxes and super for payment in just a few clicks. Clients provide fast payment approval via their PayVu mobile app. If you have payment authority, make payments on your client’s behalf. Stop constantly chasing clients for approvals & feedback. No more ABA file preparation, rework & loading into internet banking for client approval. No manual reconciliation of payments in your client’s accounting software. Easily manage multiple businesses (ABN’s) & bank accounts. 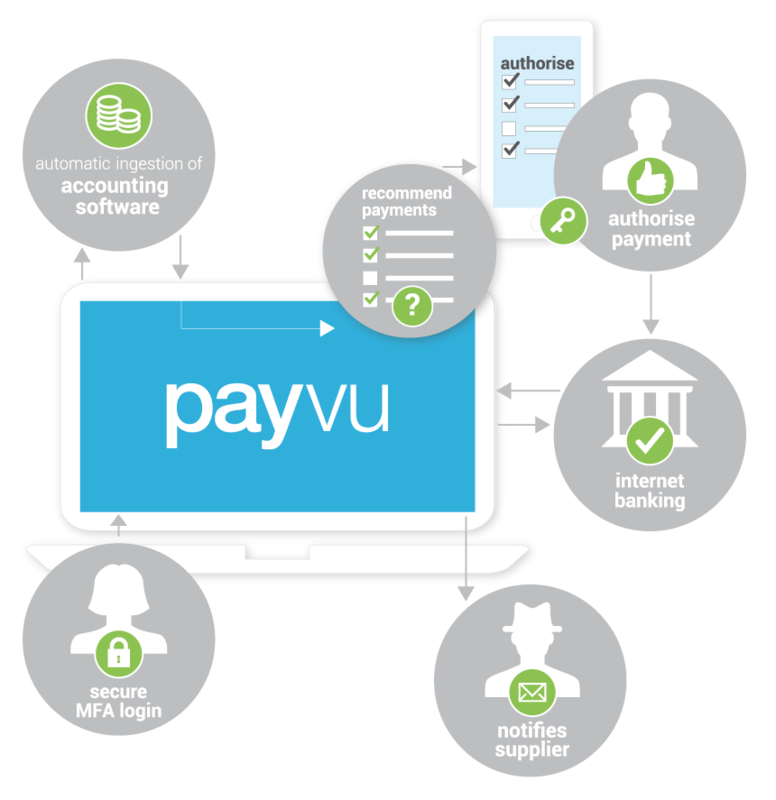 PayVu provides a single, secure login process via Multi Factor Authentication (MFA). Payments are authorised using PayVu and paid automatically via internet banking. MFA reduces the risk of an unauthorised person gaining access to your client’s systems & accounts. Never know or keep your client’s internet banking login credentials again. Never again save ABA files with client data outside of a secure accounting system. PayVu uses ClickSuper for SuperStream compliance. When superannuation contributions are paid via PayVu, ClickSuper sends all of the required SuperStream data directly to the Funds. Super contributions made with PayVu can be made up to, and including, the actual due date. PayVu sends SuperStream payments to the Superannuation funds on the same day – not 4 days later! Contributions are immediately transferred to the fund and aren’t held by PayVu, unlike the process used by super clearing houses. Log in online, anytime on your PC, Mac or tablet for a real time view of your client’s supplier bills, wages, tax and super. View all outstanding payments on one page and use our single click select and recommend process. Automated payment approvals or rejections between bookkeepers and clients. Once you make your payment recommendations, your client will be able to make fast & secure payment decisions via the PayVu mobile app. No more manual remittance advice processing. PayVu’s patented technology completes the payment process for you. When you pay via PayVu, the remittance advice is automatically sent to the supplier’s email address (as recorded in the accounting system) for payment notification. After being approved, suppliers and employees will see payments in their bank by the next business day. Suppliers will also receive a payment notification via email. Check for & resolve payment failures to ensure your clients remain ATO compliant. All transactions pass securely from your client’s accounting software to internet banking so their data is kept private. Prioritise payments, quickly & easily view payments made, and stay on top of outstanding payments. Share your screen with our support team so we can provide fast issue resolution. Learn how to use all PayVu features in our short video tutorials (60 sec or less). © 2019 InPayTech Limited. All rights reserved. Try PayVu for FREE for 30 days!